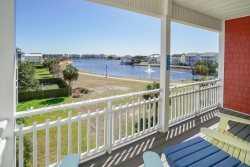 Nestled Inn is an recently updated oceanfront 3 bedroom, 3 full bathroom condo with an elevator located in the Ocean Dunes resort in Kure Beach with amazing views. Each bedroom has it's own full bathroom. The master bedroom has a king bed, a day bed with trundle, and has a beautiful sunroom directly off of it that has a queen futon. Master closet has a safe behind the door for your valuables and extra piece of mind. Newly updated bathrooms including master bath which has fully tile shower and floor with glass door and double vanity. Bedroom 2 has a king sized bed, and bedroom 3 has bunk beds with two doubles. Luxury vinyl tile throughout and the living room is open to the updated kitchen and also has a queen sized pull out couch. The kitchen is fully stocked and also has a reverse osmosis water filtration system under the sink. There is a full laundry room with washer and dryer off the kitchen. There is a large ocean front wraparound deck off of the living room and all bedrooms. Nestled Inn is located in Ocean Dunes, the only resort complex on Pleasure Island. The clubhouse with kitchen and meeting area is also home to the heated indoor pool, bathrooms with sauna, and fitness center. Outside you will find the tennis courts, basketball, shuffle board, and playground. There are also two outdoor swimming pools and multiple beach accesses. The complex offers two outdoor swimming pools, one heated indoor swimming pool, fitness center, tennis courts, sauna, Jacuzzi, picnic areas, and multiple beach accesses. Ocean Dunes makes beach living possible year-round with access to the heated indoor pool, sauna, and fitness center.